Cute idea! Yes, I have been trying to figure it out this afternoon as well. Some parts I really like and some not so much. 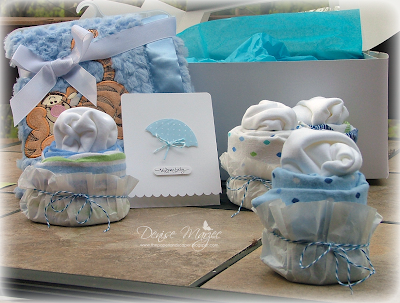 Denise, this has got to be the cutest baby gift I have ever seen...love your cute little card too! I hear you about the new blogger. I am having a hard time figuring it out too. Not just the pictures,everything! Your not the only one having this isssue! Why change what worked. Awwww, how cute! I love it! What a fantastic presentation of baby gifts! WOW, that's really cute!! With the new blogger, just highlight and add one picture at a time, write some, then go back, highlight another picture and add it, write some, etc. I found it impossible to move them if I add them all at once! 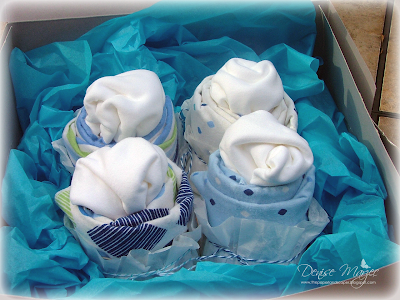 Denise, this idea is so cute and precious...thank you for sharing. Blogger, I always think it's me...because the whole thing baffles me. I'm surprised that I even have a blog...I just keep plugging along, but please any thing you figure out...or any hints...please share...LOL. What a fabulous gift Denise! It's just gorgeous! Adorable Denise!! And not one single calorie! Darling gift set Denise. Looks awesome! What a wonderful gift set Denise. So creative. Love the cute card and that blanket. this came out so cute! the tissue in the box, really does add a little something more to it.